Schedule your own private class today at Atlanta Hot Glass! Private classes are scheduled based on student requests and instructor availability. View our different class descriptions below to decide which is best for you. Class requests require at least one week advance notice to be scheduled. Book in advance to secure a desired date/time, weekends get filled fast! Studio Members receive 10% off of all classes and studio rental rates. Visit our Calendar to view upcoming scheduled public classes and events. Work one-on-one with our instructors to create unique hand-made finished pieces. This is a fantastic single or group activity for those interested in learning about hot glass. Price starts at $190 and includes up to four pieces. Larger groups can be accommodated with an additional charge per person. Final cost and number of pieces may vary depending on number of students. If you have never tried hot glass before, this class is a great introduction to the material! Thank you! We will be in touch shortly regarding your class inquiry. Book a memorable evening with us and learn about hot glass with your date! Our fabulous instructors will walk you through each step of the creation process one-on-one or as a couple. Share this unique experience and take home original art works to remind you of the fantastic time you spent together. Price starts at $190 includes up to four pieces. Larger groups can be accommodated with an additional charge per person. This class is a great way to impress your date and learn something new! Also a great double date! 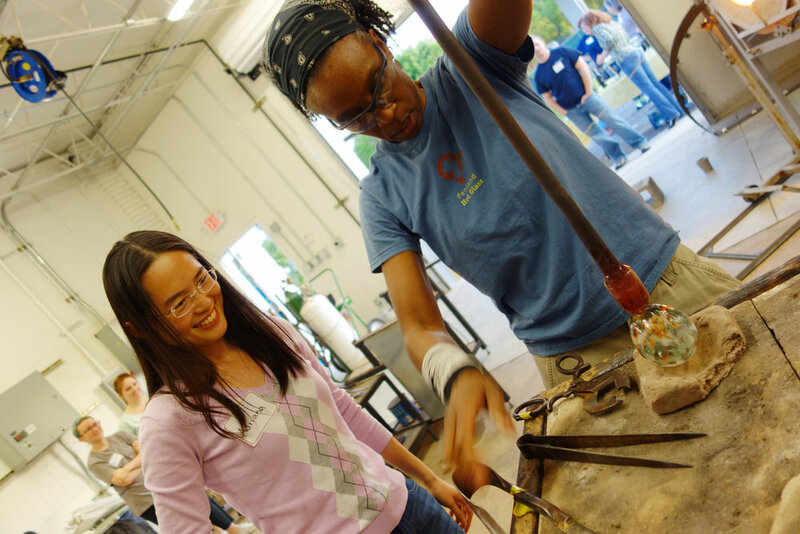 Want to build your skills and learn how to be a glass blower? This course will introduce you to our facility and the fundamentals of working hot glass. Students will learn to gather out of the furnace, create starter bubbles, and work on blown forms. Repetition and team work will be emphasized along with safe and effective studio habits. Classes can be scheduled all in one week, or once a week for four-five weeks. Discounts available for groups of 2-3 students, lower cost per person and more hrs of instruction. Bring a sketch book! One copy of Ed Schmid’s Beginning Glassblowing Book included. 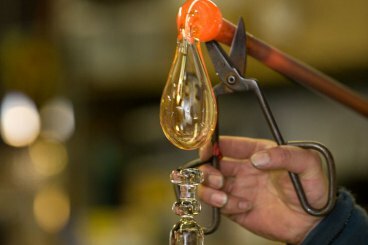 If you're serious about learning the skills to blow glass, this is the class for you! Inquire for more info. Have you taken a few classes elsewhere or are feeling a bit rusty in your skills? Looking to focus on a specific technique or idea but need some support? We offer personalized teaching sessions custom tailored to your needs. Please detail what your goals are in the submission form and we’ll develop a custom lesson plan and pair you with the right instructor just for you. Pricing TBD. If you're an individual with previous experience wanting one-on-one instruction, this is the option for you! What should we wear? Cotton or natural fiber clothing & close toed shoes you don't mind maybe getting dirty. No synthetics or loose fitting clothes please. What kind of pieces will we make? Students in one time classes usually make paper weights & ornaments, with special seasonal options offered throughout the year. How old must kids be? Ages 10(+) for classes. Kids under 10 can make glass "coins" for $5 during public events / classes. When can we take our pieces home? All handmade glass pieces must be cooled slowly in annealing ovens - generally pieces are available 48hrs after class to be picked up. Where is the schedule for classes? All classes listed on this page are scheduled based on student requests. Please visit our Calendar to view upcoming scheduled public classes. Class prices updated April 16th 2019.